Mopar pulled generously from its portfolio of more than 100 accessories available for the Pacifica to customize the Chrysler brand’s family-room-on-wheels and to create the Chrysler Pacifica Cadence concept. 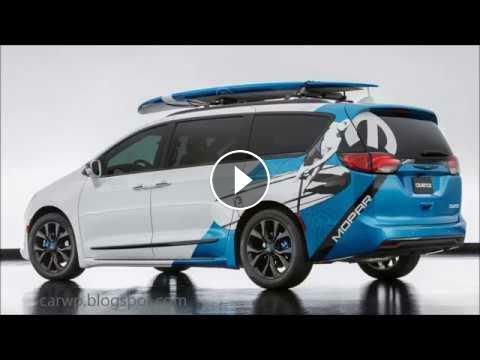 The all-new minivan’s bold styling is tweaked with custom Mopar graphics wrapped on the quarter panel and rear of the white exterior, expressing the vehicle’s active lifestyle, paddleboarding theme. A collage of Mopar Omega M logos liven up the hood. In addition to convenient interior storage options, such as Stow ‘n Go cargo bins, a Mopar/Thule paddleboard/surfboard carrier is added on top to transport a large 9-foot paddleboard re-branded with Mopar graphics. Production Mopar 20-inch wheels are tri-color, tinted in Satin Black and Gloss Black tones with a Mopar blue accent on a single wheel pocket. The center cap is customized with a Mopar blue “Omega M” logo that matches the blue pocket accents. A Mopar running board provides a lift into the Pacifica and molded rear splash guards are adorned with the Chrysler logo. Mopar also splurged on accessories on the inside of the Pacifica Cadence. A pet kennel safely allows four-legged family friends to join in the fun. Wireless charging powers up mobile devices and a Chrysler-logoed first aid kit is available for emergency duty. Chrysler logo door sill guards, all-weather floor and cargo mats and a light duty vinyl mat for the second row complete the Mopar accessory upgrades. World Gymnaestrada 2015 -- Switzerland takes center stage -- We are Gymnastics!